Coin Up! | The Arcade Archives! Coin Up! Review Of Pulsar! Welcome to another Coin Up Review! This is something I wanted to do from the beginning- online reviews of games that we couldn’t devote an entire podcast to, but a written review would do nicely. So keep an eye out- I might review that game you have always liked, but couldn’t put your finger on the name- or you just secretly liked while playing your friends at Karate Champ. 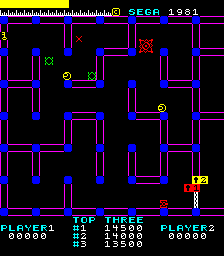 Is a unique maze game released by Sega/Gremlin in 1981. The player controls a tank that’s in a very strange maze. The player must collect the colored keys to unlock the airlock and escape to the next, more challenging maze.But, you are not alone… hear that heartbeat? that’s the Pulsar, looking for you! Large and seemingly harmless, it is filled with aggressors, just waiting to break out and destroy you! Get all your keys to the airlock and and try to escape… THE PULSAR! 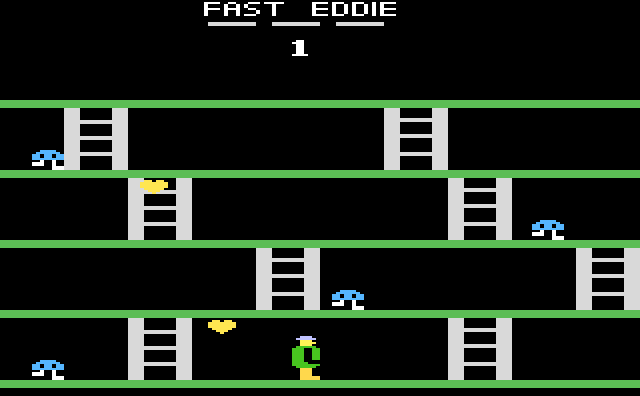 I first saw this astonishing game in May of 1981 at a little Mom and Pop convenience store that was right next door to my Junior High School. They had a little back room area that they would put 5 or 6 games in, and that was great for them, as the kids would come over after school ( or sometimes, when school was in session- don’t tell my Mom!) They always got some great games in (Battlezone, Turbo, Astro Fighter) and between the candy, soda, and arcade games, the place was always hopping! And after the first play on this game, I was HOOKED! The key to this game is speed. You get bouku bonus points completing a level with the most fuel. So, the first thing to do is assess the maze- more important, where are the keys? On top? On the sides? Remember, the maze is ALWAYS MOVING! Also, don’t be afraid to get close to an aggressor to shoot it. Running into them won’t kill you- and it’s a great way to get some fuel! And remember- you don’t have to get the keys in numerical order… you just have to get them to the keyholes! This is your tank. It is capable of 360 degrees of movement quickly. The tank has a laser cannon powerful enough to shoot a beam across the maze at a target. It can move fast through the corridors of the maze, but at the cost of your fuel- shoot the aggressors to replenish. This is the Pulsar. It seems to be a living organism in the maze, as the Pulsar’s heartbeat can be heard throughout it’s confines. It is following the tank, sensing wherever you are in the maze. It has no defense, and you can run into it, but what would happen if you shot at it? This is a Yellow Aggressor. It rolls on the walls of the maze,and is harmless to the touch. shoot it for more fuel. This is the Green Aggressor. It bounces around the maze randomly, shooting at you. It too is harmless to the touch, and if shot, helps replenish your fuel reserve. This is the Red Aggressor. it makes a fast beeline towards you shooting quick. Again, it is harmless to the touch, and when shot will go towards your fuel. Keys are what you are after on all the sides of the screen. They will unlock the keyholes to the airlock at the bottom right hand side of the screen. when you grab a key, your tank’s color changes to the keys color. You have to collect different color keys for each keyhole. The keyholes unlock the airlock, allowing you to enter the next maze. Each lock matches a corresponding colored key. You can do them in any order, but you must unlock all keyholes to successfully enter the next maze- before running out of fuel! I feel the biggest enemy in this game is the maze. It shifts and changes with every beat of the Pulsar’s heart. It does two things- walls open and close, and it creates deadly force fields which can kill on contact! Just when you think you have the key, or your near the exit, the walls move blocking your path! This one’s a no- brainer… There were NO ports of Pulsar for home play that I know of (a shame) But one that was about as close as you could get at the time ( I guess ) was Tanks But No Tanks for the Atari 2600. I guess its cross between the tank level in Tron and the game Tank Battalion , but the movement is fast, and you shots go across the maze. The object here is to protect the base at the bottom from the screen from the oncoming tanks who want to destroy it. Not a bad game , but not very exciting. But a good hacker COULD make this Pulsar. Also, you can play this game on the M.A.M.E. emulator http://www.mame32.com. 1981 was a transitional year for video game technology. 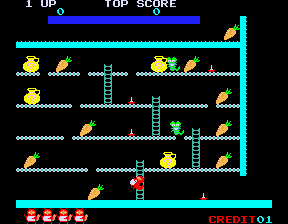 You had games like Donkey Kong and Defender pushing the limits of what a game could do at the time. Then, you have games like Pulsar. Graphics like this were still the norm at this point, so they work just fine. The character animations are great, and the moving maze parts add to the excitement. The sounds all work for a sci-fi game ( I especially like the sound of the pulsar exploding!) , but what really gets you going is the haunting heartbeat that you hear throughout game play. So, I think the simplicity of this game is what works. Controls are quick, concise, and simple for a game of this era. If I had any complaint its a minor one- there’s only one fire button- on the right side- great if you are a rightie. Sega should have put the stick in the middle and fire buttons on each side. this was very typical in early 80’s arcade machines. Probably a cost issue during it’s manufacturing cycle. I think with the simple objective, the game gives you a few rounds to get used to the movement of the maze itself. After round 5 though, with five keys to collect, the maze changing fast, and even more aggressors, you got your work cut out for you!!! With it’s simple but changeling game play, you will be coming back to play Pulsar again and again to see what else it has to offer! I think Pulsar holds up today because it truly is a golden age arcade game- great graphics and sound for a game of this type and age, cabinet art is simple, colorful and enticing to the eye. It just keeps pulling you in for just one more try!!! Hey gang- as a special treat, I will making collectible trading cards of all the reviews I do on the site! The front has general stats (name ,year, manufacturer) the back has game play tips! Collect ‘em! Trade ‘em! they make great holiday gifts! Please give me a shout and let me know how I did!